UPDATED: Wed., April 19, 2017, 10:53 p.m.
After three years operating downtown, Spokane’s community court is reaching into new neighborhoods and eyeing a second location. People cited for low-level crimes in Browne’s Addition and Cliff-Cannon can now be referred to the court, which addresses low-level crimes like public urination, trespassing and sitting or lying on downtown sidewalks. The court, held Mondays at the downtown library, tries to address the root causes of petty crime by connecting people to social service providers who can help people get housing, medical insurance or addiction treatment. Rather than going to jail, people who complete eight hours of community service and meet with providers have their charges dropped. “There’s an accountability that comes with community court. 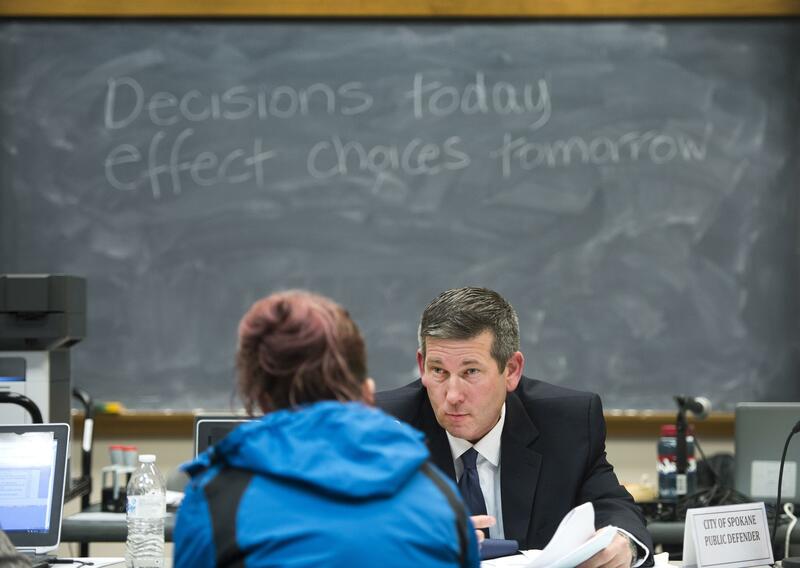 There’s more responsibility-building here, and that’s accomplished by giving people stuff to do and giving them a way to do it,” said city prosecutor Adam Papini, who’s one of two city attorneys staffing the court. Papini and public defender Francis Adewale work together to help people get through the program. “It aligns with our vision of community prosecution, community defense,” Adewale said. The expansion came about a month ago after court staff realized people who often hang out downtown were migrating up the South Hill and west into Browne’s Addition. Neighborhood councils in both places were seeing similar “quality of life” violations, so the court worked with the Spokane Police Department’s South Precinct to train officers on referring people. “It didn’t need its own court. It’s just sort of a natural extension,” municipal court Judge Mary Logan, who presides over the court, said. About 15 or 20 people from the new areas have been referred to the court in the weeks since the expansion, staff said. But a bigger expansion is in the works. The court is expanding to a second location thanks to a $200,000 grant from the Center for Court Innovation and the Department of Justice received last summer. West Central, East Central and Hillyard are the three neighborhoods being considered for a second location. The type of crime targeted would depend on the concerns raised by neighbors, but court staff said property crime has been a big concern in all three neighborhoods. “It’s always been about the issue the community raises. It’s a problem-solving court,” Logan said. The challenge is finding a way for the court to be effective with a new type of crime. They can only handle misdemeanors. Crimes like car prowling might be difficult, because a relatively large number of victims are targeted by relatively few perpetrators and might not generate enough volume to justify a dedicated court. Court staff have been conducting community forums in all neighborhoods over the past few months and expect to make a decision on the site in May. All three neighborhoods have been excited about the prospect of getting a community court in their area. Adewale said it’s taken several years of trial and error to build the downtown court into a successful one that’s earned praise from police, downtown businesses and social service providers. The same will likely be true for the new location, he said. “It’s not easy to just ride into town,” he said. Published: April 19, 2017, 5:40 p.m. Updated: April 19, 2017, 10:53 p.m.